One of my favorite Google Apps resources is Google Calendar. If your school has enrolled in Google Apps for Education, it is part of your GAFE suite of tools. 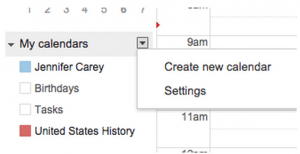 With a Google Calendar, you can more effectively organize and plan your administrative tasks. Here are some quick tips to help you to effectively wield your Google Calendar tools. You can give members the ability to subscribe to the calendar to view updates or even grant them the ability to edit it. To do this, simply open up your Google Calendar and scroll down to “My Calendars,” press the down arrow and select “Create new calendar.” Give the Calendar a Title and include a brief description. Next, check the box “share this calendar with others” and select your sharing settings. Do you want it to be a public calendar that others can only view, share it out publicly only with people in your organization, or do you want to invite specific people who can then add items to the calendar? Google Calendar allows you to be flexible here with multiple levels of access and sharing; for example, you can allow some people to view and others to edit. As the creator of the calendar, you can always change or revoke another person’s access to it. This is a great way to keep a group organized. By keeping a shared calendar with faculty, you can schedule tests and major assignments to make sure students don’t get overwhelmed. If you have resources, like computer labs or iPad carts, you can allow faculty to “reserve resources” on a campus calendar. Google Calendar also allows you to set up appointment slots without sharing your whole calendar with others. This is a great way to hold open office hours or allow people to book time with you; it will also let your faculty, students, other administrators, and parents know your availability without publishing your entire calendar. Note that you can only use this feature with a Google Apps for Education (GAFE) or a Business account; it will not work on a personal account. If you’re like me, you’re always on the run; going to a meeting, a class, or just trying to grab a bite of lunch. My Smartphone is my organizer on the go because it’s readily accessible and I can see my schedule at the touch of a finger. One of the great things about Google Calendar is that it resides in the cloud, so you can sync it wirelessly across devices without thinking about it! If someone emails you a calendar invite and you accept it on your desktop, it will populate your calendar on your laptop, smartphone, and/or tablet. Likewise, if you are stopped in the hallway and someone asks for a meeting, you can schedule it on your Smartphone and it will then appear on your calendar across all of your devices. Here are the instructions for setting up Google Calendar syncing with your with Android & iOS devices. If you need a little extra push to keep you going, you can even have Google Calendar send you a reminder with a text message directly to your cell phone (price subject to your texting plan). Video conference calls are becoming more popular as they allow you to engage beyond a disembodied voice. Google Calendar allows you to not only schedule a video conference call, but to include a link within the calendar appointment that users simply click to join. This is much faster than logging into Google Hangouts or Skype and inviting people manually. With aGoogle Hangout, you can have up to 10 people in the same call; so you can easily navigate remote meetings, interviews with multiple participants, and more. Often, our calendar events include meetings to review different documentation, such as policies and procedures, or to discuss a specific agenda. To keep everything organized, you can attach a document to your event. 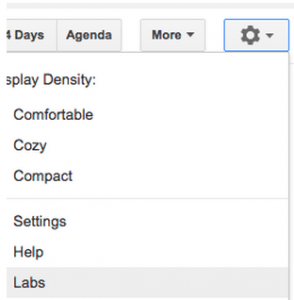 This is a feature that requires you to enable “Labs” in Google Calendar. Now when you create a new event you will have the option “add attachment” available. When participants log on to the calendar, they will see the attachment and have the ability to download it. There are a lot of great ways that Calendar can make your administrative duties more organized and streamlined. Explore other tips and tricks as well as more Lab options. This entry was posted in Education, Educational Resources, Educational Technology, Google, Technology and tagged administration, calendar, Ed Tech, Education, educational administration, Educational Technology, GAFE, Google, Google Apps for Education, google calendar, organization on March 16, 2015 by Jennifer Carey. One of the most powerful ways that administrators can encourage their faculty to adopt new technologies in their classroom and curriculum is by modeling effective application of new digital tools. With Google Apps for Education, there are many tools that are helpful for administrative tasks, providing a number of ways to effectively model technology usage on a daily basis. 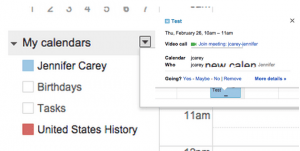 Use Google Docs to create and share meeting agendas. Not only will it prep your faculty for meetings, but they can use the document to keep shared, electronic notes; this is especially useful if you have a designated individual to keep minutes. You can include live links for content, embed materials, create & share calendar events, etc. These are not possible in a static, paper document and not only demonstrate your commitment to adopting new technologies, but also help spark the imaginations of your teachers in applying these new tools in their own classrooms. If you visit and observe classes, then turn your classroom observation forms into Google Forms. Having an electronic form will save you time and space. If you have a tablet or smartphone, you can complete the form easily on a portable device. Also, by using a Google Form, you can quickly email the contents to faculty, department chairs, and HR. Here is an example form for observation. If you need chaperones for a school dance or field trip, lunch duty, or detention, Google Forms is a simple way to have faculty and staff respond. You can easily share a form via email or post it on your school’s website. With the new Google Forms Add-Ons, you can limit responses by automatically turning off the form when you reach maximum participation, set up notifications when faculty respond, and export it to a shareable Google Doc when you need to share information (such as chaperone contact information or time slot sign-ups for an event). One of my favorite features in Google Calendar is setting up “Appointment Slots.” Keeping an “open door” can be tricky; it’s difficult to get your work done when you are regularly interrupted. Posting your calendar can also be problematic as even if you have nothing scheduled, you may want that time reserved for administrative work, phone calls, or lunch! With appointment slots, you can designate certain times you are available for meetings. This is a great way to have your faculty sign up for face-to-face time with you as well as keep you organized. If you would like a step-by-step tutorial, check out this great video by The Gooru. Schools often struggle collecting images of field trips, school plays, and other activities. If you would like to facilitate this process, then share a folder with the community that they can use to upload videos and photos. When you designate a shared folder, be sure to explore the various options available to you and apply them appropriately. You may want to share the folder only with the certain teachers and students, the whole school, or the broader community like parents and alumni. The flexible sharing options make it easy to individualize. What makes Google Folders such a great way to collect materials is the fact that most people use their phone as their camera. With the free Google Drive App for Android or iOS, they can upload directly from their device. Google Apps is a flexible and robust tool that can facilitate not only teaching, but also administrative duties. Additionally, by modeling effective use of technology with your own administrative tasks for your faculty, you familiarize them with available tools and encourage them to apply them in their own classrooms. For an opportunity to learn more about using Google Apps for Education, join EdTechTeacher and Google for the firstEdTechTeacher Google Jamboree. Registration is FREE! The deadline to apply is January 7th. This entry was posted in Education, Educational Resources, Educational Technology, Google, Professional Development, Technology and tagged administration, Ed Tech, Education, educational administration, Educational Technology, GAFE, Google, google apps, Google Apps for Education, google calendar, google doc, Google Docs, google forms on January 6, 2015 by Jennifer Carey. While the title of this talk is iPad for Administrators, the focus is less about administration and more on working as a leader (in every capacity) in the school. Chris works for a public school in NYC of about 1,000 students. Administrators view iPads primarily for three things: communication, collaboration, and observation. They often have a fourth goal as well: going paperless. iPad is an amazing tool for communication and for being able to do so silently. Using a traditional PA system is loud and disruptive. In a school environment, we seem to either be inundated with information via interruption, or we are entirely out of the loop. In terms of communication within a school, we have the old standby of technology: the email distribution list. This way, we can limit information to a select group and send it out electronically. 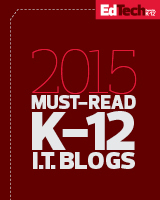 If teachers have iPads, they are not tied to a computer, they can get it on the go. In addition to traditional list serves, there are also new media being used by schools: blogs and Twitter that can readily be followed by students and faculty. While using hashtags is new, administrators seem to be embracing it. The school has various hashtags that they use to disseminate information, and since so many students, as well as parents, are on Twitter that it can be a faster medium by which to distribute information. Collaboration at PS10 in Brooklyn is primarily in the cloud (they are a Google Apps School), and they also use DropBox to share information. The school has various shared folders that they use for administrative details, staff, and/or students. This is another quick and easy way to distribute information as it limits paper distribution and inbox clutter. In addition to DropBox, the school uses Google Drive. By using Google Drive, not only can staff and students share information but they can also edit them live. Google Drive is still fairly new, and it is not as iPad friendly – yet. Chris said that they currently prefer DropBox as it is more adaptable for various programs and more cross-platform friendly. The great benefits of the cloud is that content can always be accessed regardless of device or platform. Chris also likes to use the program DROPitTOme for student submission of work. It helps to keep all content for a class in one place. Using DROPTitTOme means that you no longer have to manage folders or sharing permissions. It is purely a submission element. However, Chris does say that ultimately they will move entirely to Google Drive in the next few years. Chris’s ultimate message is that you have to try things out. Fortunately, iPad apps are cheap or even have free “lite” versions. Two dollars is a worthy investment for exploration. If you want to try something new, try it out. It’s about being flexible and finding options. Ultimately, iPad can help administrators and educators achieve that fourth goal: to become paperless (or at least less paper-y). Take the printer out of the thought process. Send it to iPad! You can view all of Chris’ presentation materials – as well as those from other presenters – on the iPad Summit web site. This entry was posted in Apple, Education, Educational Resources, Educational Technology, Technology and tagged Ed Tech, ed tech teacher, Education, educational administration, Educational Technology, google apps, information collaboration, iPad, ipad summit, ipad summit atlanta, ipads, paperless, Technology on April 11, 2013 by Jennifer Carey.